One of the sweetest creative gifts I have given myself is to honor my gifts with practice and also the times I have gathered with other creatives and honed my skills, took the time away and made my creativity a priority. I often don’t realize how fast we are moving or how much we are pushing each day until I schedule breaks, creating and time with friends. 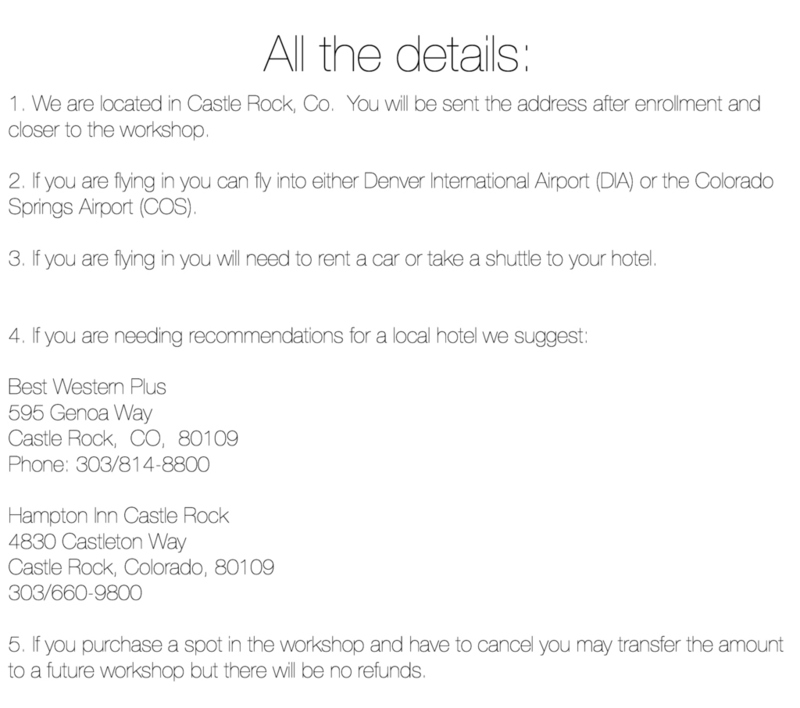 I would love to invite you to the last two workshops in our studio of the year. Time to gather, rest, create and practice. Let us take care of you for a few days and it is our hope that you will leave with fresh inspiration and the magic that happens when we gather. 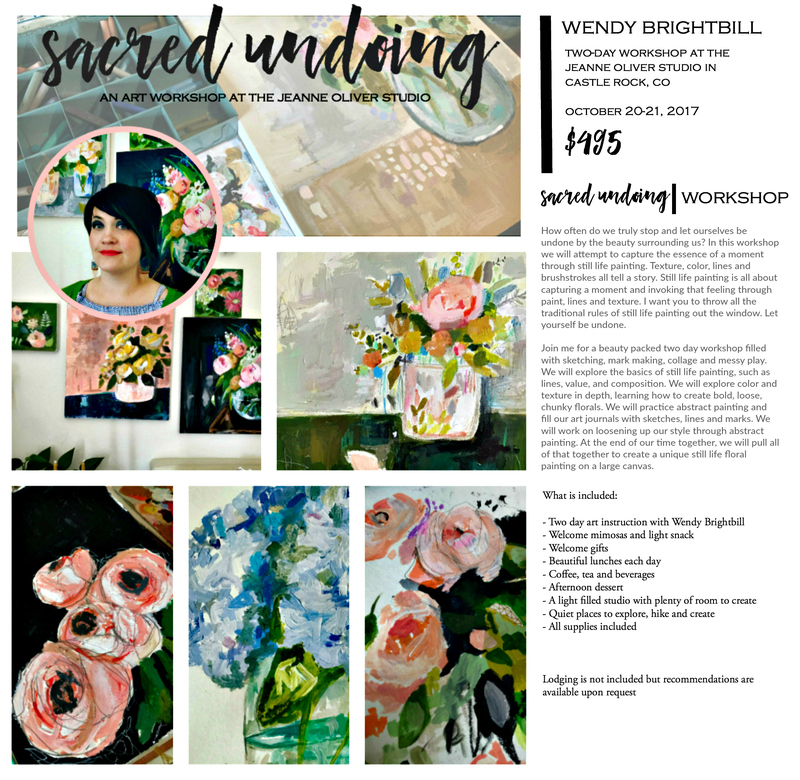 Join Wendy Brightbill in beautiful Castle Rock, Colorado on October 20-21, 2017 for a two-day art workshop. 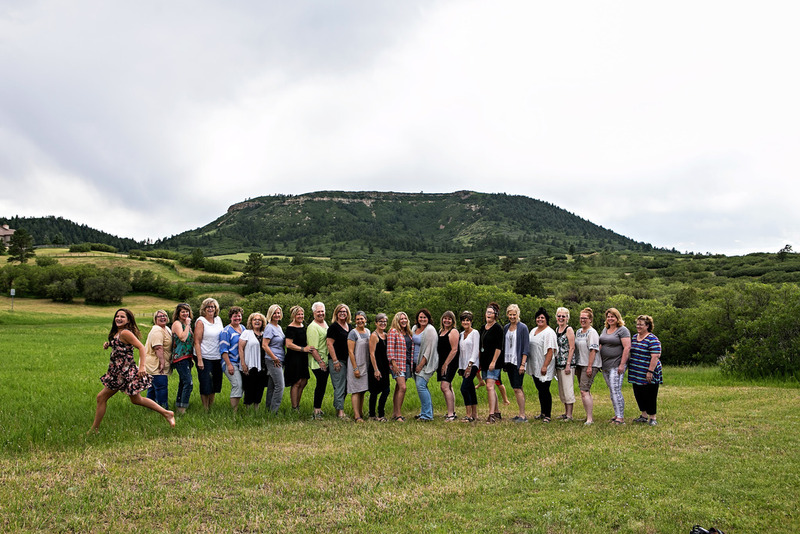 Join Stephanie Lee in beautiful Castle Rock, Colorado on November 10-11, 2017 for a two-day art workshop. YOU ARE HERE TO CREATE – LIFE, ART, LOVE, PURPOSE, NEW THOUGHTS, JOY, STORIES. LET’S CLEAR AWAY ANYTHING THAT GETS IN THE WAY OF THAT. 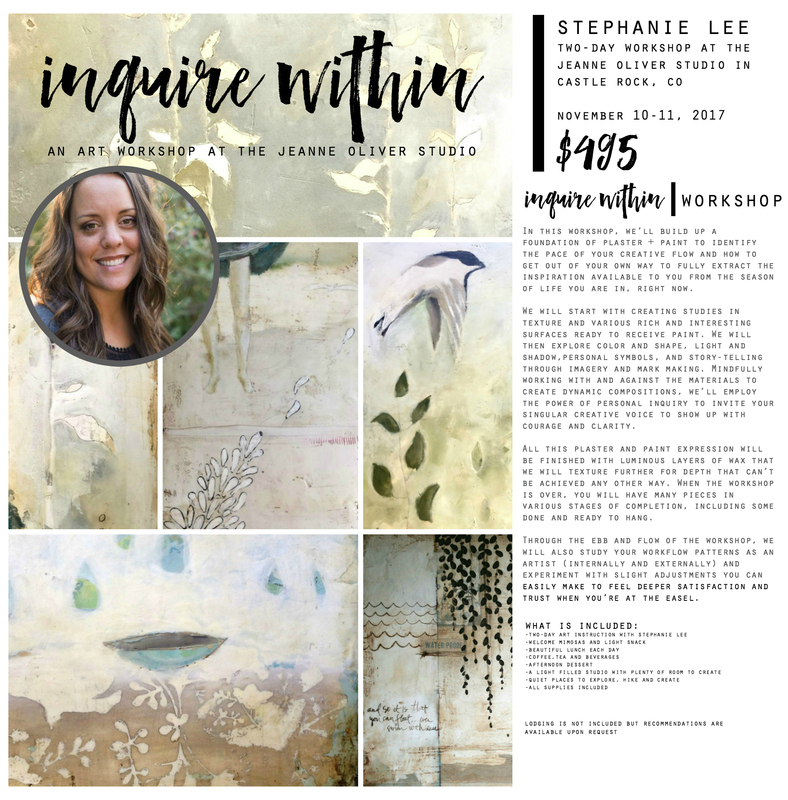 In this workshop, we’ll build up a foundation of plaster + paint to identify the pace of your creative flow and how to get out of your own way to fully extract the inspiration available to you from the season of life you are in, right now. We will start with creating studies in texture and various rich and interesting surfaces ready to receive paint. We will then explore color and shape, light and shadow, personal symbols, and story-telling through imagery and mark making. Mindfully working with and against the materials to create dynamic compositions, we’ll employ the power of personal inquiry to invite your singular creative voice to show up with courage and clarity. All this plaster and paint expression will be finished with luminous layers of wax that we will texture further for depth that can’t be achieved any other way. When the workshop is over, you will have many pieces in various stages of completion, including some done and ready to hang. Through the ebb and flow of the workshop, we will also study your workflow patterns as an artist (internally and externally) and experiment with slight adjustments you can easily make to feel deeper satisfaction and trust when you’re at the easel. 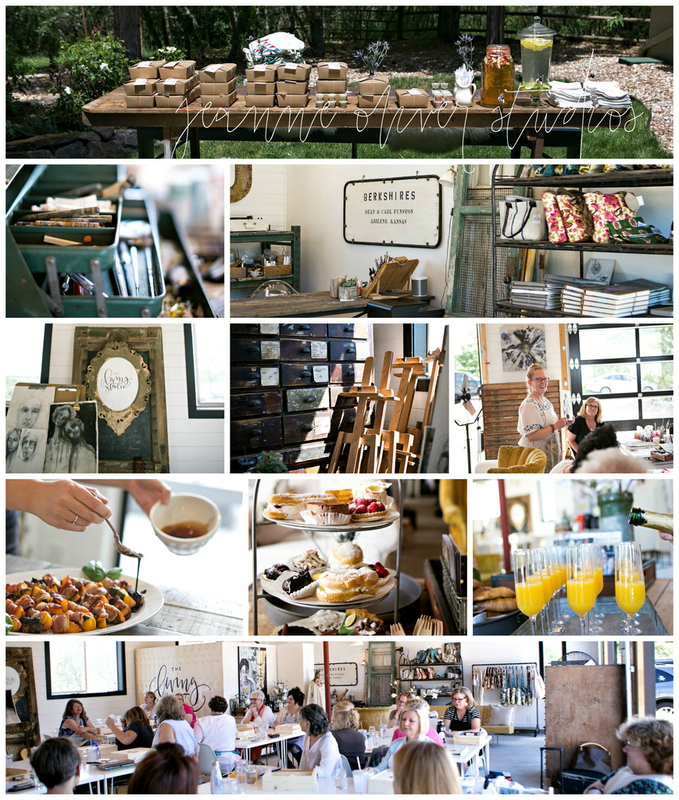 If you have any questions please email us at contact@jeanneoliverdesigns.com. We hope to see you soon in the studio!